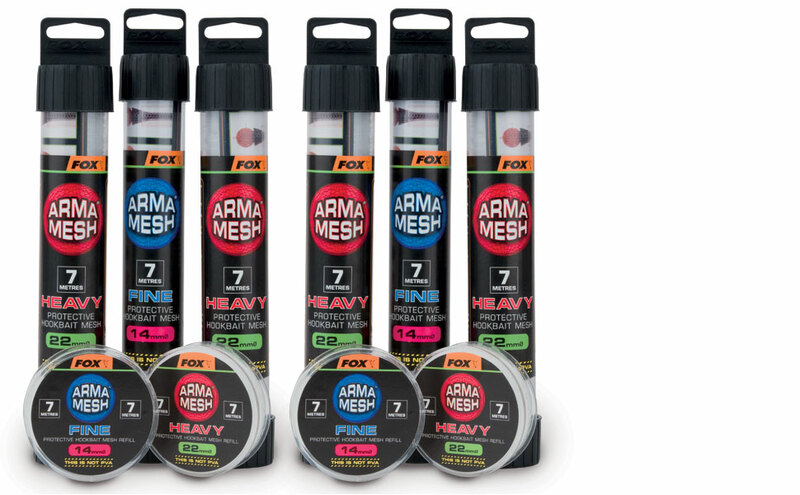 Quite simply one of the biggest advancements in hookbait systems ever, Arma Mesh is available on 7m tubes with both Narrow (14mm) and Wide (22mm) diameter variants and new for 2011 both Fine and Heavy weaves are available. It has a tough hexagonal weave, similar in appearance to PVA, but it is made from nylon and DOES NOT DISSOLVE IN WATER so instead of using it to create a pile of free offerings around your hookbait as with PVA, you use Arma Mesh to create actual hookbaits. As with PVA, Arma Mesh is supplied on a loading tube with a plunger and you create small bags of bait in exactly the same way - but you then thread it onto your hair as you would a boilie – it’s that simple! Arma Mesh allows you to create totally unique baits; not only can you present really soft baits such as bread, meat, cheese, prawns and pastes perfectly and fish them at range but it also opens up possibilities with baits which are not easily hairrigged such as hemp, canned tuna, mini pellets, boilie crumb and liquidised bread - the only limit is your imagination! Arma Mesh is also perfect for protecting hookbaits from nuisance species and meshing pellet hookbaits will prolong their underwater life allowing you to fish them all day – or night. Select the Fine denier weave for most angling situations but step up to the double thickness Heavy version where species such as crayfish are a real menace.